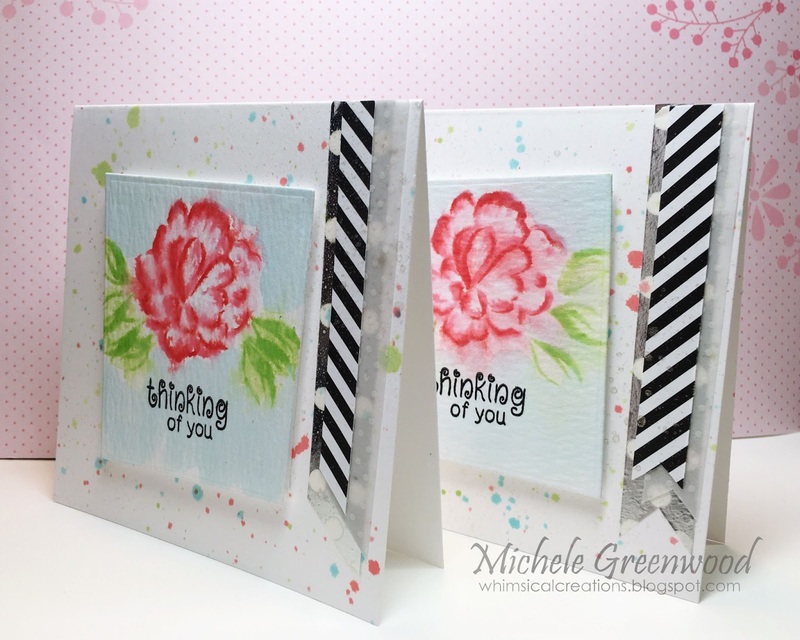 Jennifer McGuire calls it distress ink lifting and Kelly Latevola calls it watercolor bleaching – and I call it lots of fun!! Both techniques add color back to the image – Jennifer uses more distress ink and Kelly used Copics and I basically followed her technique. Either way you can get a lovely tone on tone look which is our challenge for May. 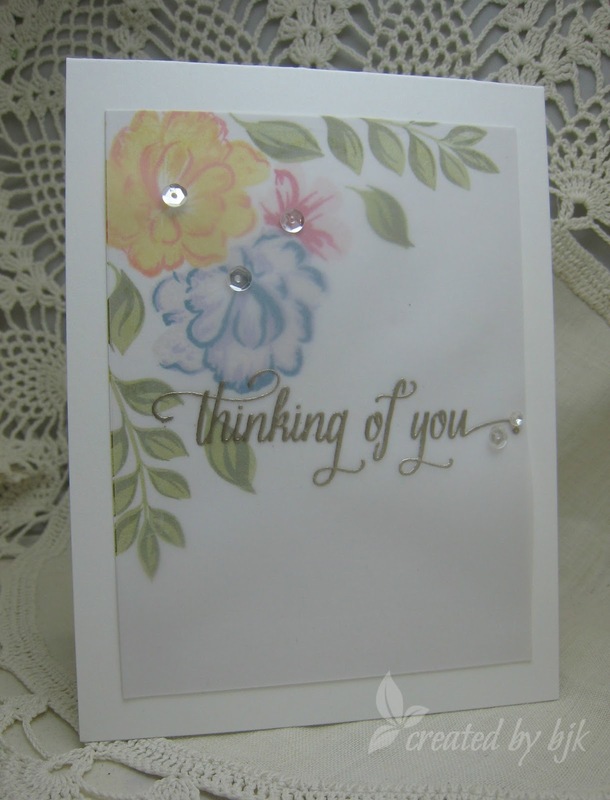 I cut a piece of watercolor paper to 4×6 and stamped the flower from the April Hero Arts My Monthly Kit with Versamark. I heat embossed it with Hero Arts white embossing powder and then masked it to stamp the leaves. Then I sponged spun sugar and abandoned coral distress ink over the whole piece. Now came the fun part – removing the color from the flower and leaves with a small brush and water. I used Copics to shade around the flower and to add a bit of color back into the flower and leaves. 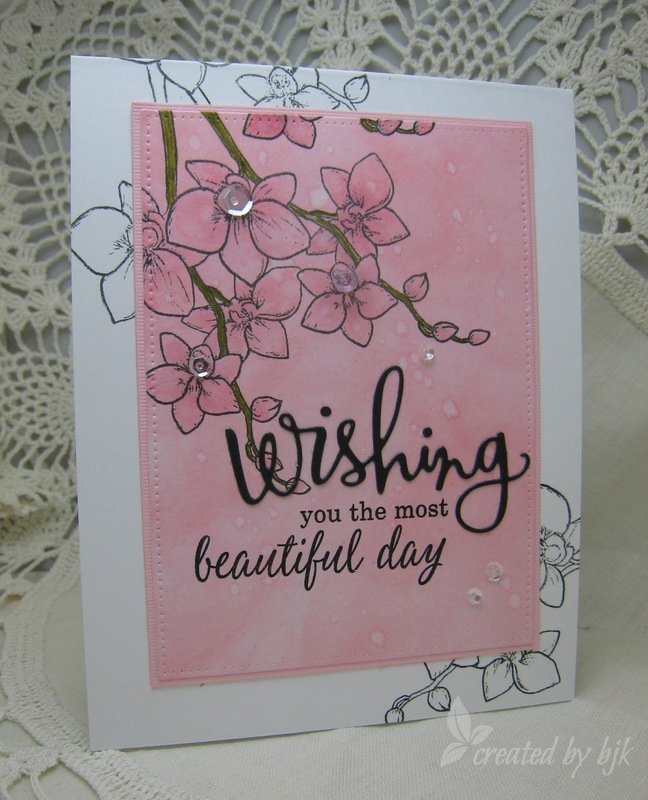 The sentiment (also from the HA kit) was stamped in Hero Arts black ink(masked off the “wishing” from the stamp) and then added the “wishing” die cut. Finally I die cut the piece with the frame die – popped up the frame part with foam tape on a white card base and put the center back, added a few sequins – and done! There is still time to enter our challenge this month – click on the icon on the upper right of this post or also here. Gina K Designs has a great prize for the winner! Thanks for stopping by today and have some fun creating a tone on tone card!! 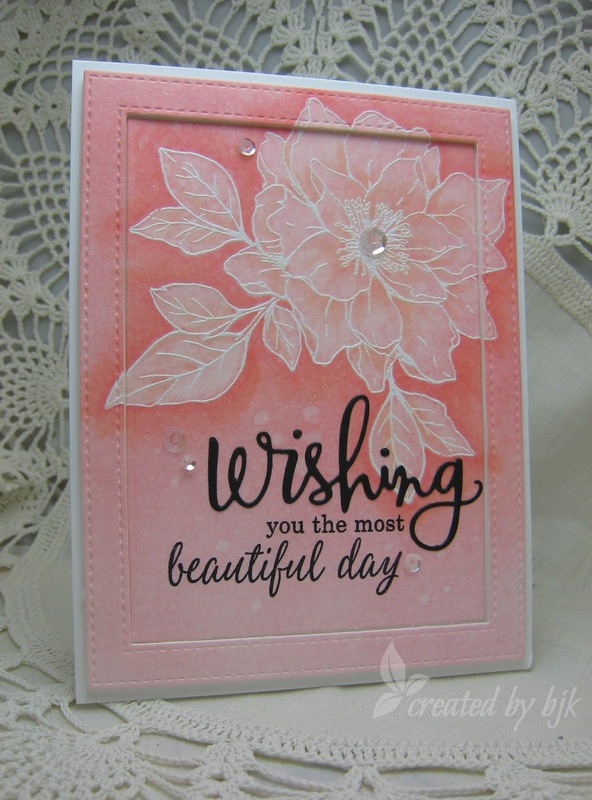 and I’m am thrilled to be using their beautiful stamp set, Elegant Florals 2. 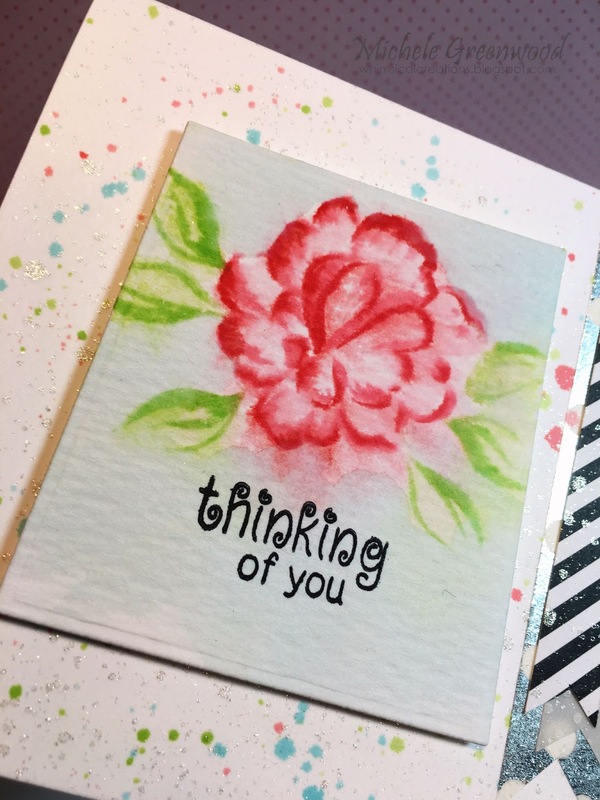 I sponged a piece of white cs with distress spun sugar and then stamped the flowers with HA intense black ink – it’s archival and thus great for watercoloring. Then I used my spun sugar distress pen and a little water to give the flowers a deeper tone of pink and distress pen in peeled paint for the stems. Also spattered some water drops. The piece was then die cut and mounted on a little larger piece of pink cs. 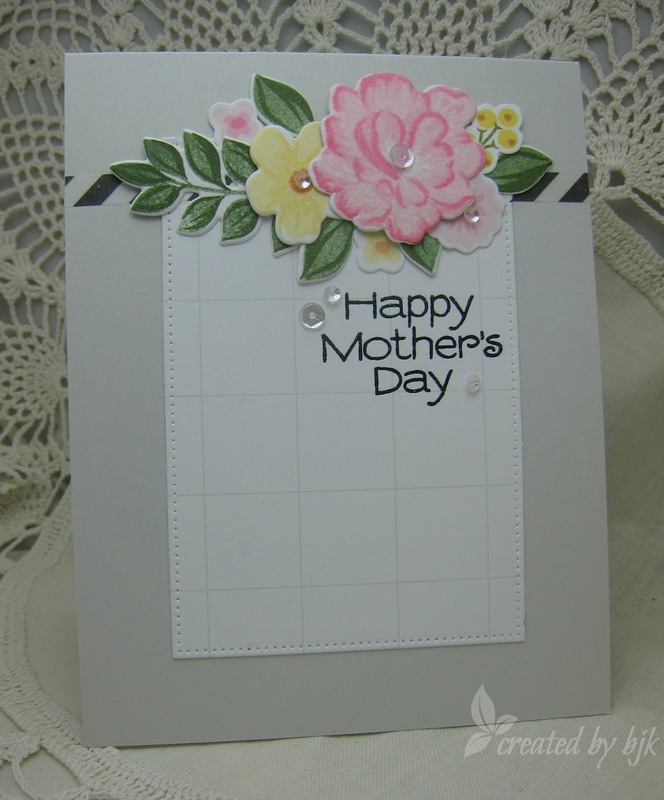 I used my stamp positioner to line up the flowers again for the background on the white base. The “wishing” was die cut and the rest of the sentiment was stamped. I blocked off the “wishing” on the stamp with a piece of tape, inked it, removed the tape and stamped. I love this HA sentiment from the April My Monthly Hero kit because it can be used for various occasions. My first card for this blog was basically the same design, but I really like it and thought it worked well with this stamp. Thanks for stopping by today and be sure to enter our May challenge here and have a chance to win a prize from Gina K.
To me CAS has always meant lots of white space but with texture and interest. Sometimes it’s difficult tho not to add more of a little bit of something. Since Mother’s Day is only a few weeks away, I decided to use my new Layering Flowers set to make a bouquet. Stamped a whole bunch of flowers and then started playing around with an arrangement. I didn’t have any small flowers from Hero Arts so used some from another set to tuck in here and there. When I was happy with it, I used Laurie Willison’s “press ‘n seal” method for keeping it in place. Since the flowers were attached to the press ‘n seal, I was able to play around with the placement of the sentiment. Stamped the sentiment and added the little strip of black stripe before finally putting it all together with a few sequins for sparkle. There’s still a few days to create your CAS card and enter it in our challenge and be eligible to win a lovely prize from our generous sponsor, Newton’s Nook. Thanks for visiting today.